It's the time of year to gorge small children with sugar and make them pee their pants! Which also means it's time for Susanna Leaonard Hill's Halloweensie contest. The rules: your Halloween story must be 100 words or less and include the words black cat, cackle, and spooky. Last year I wrote about the poor Jack O' Lantern who couldn't go trick or treating. This year I'm tackling the serious issue of feline bullying. This particular entry was inspired by a "Short & Sweet" Susanna also hosts monthly. Wearing fur so milky white!" "I can too cause children's cries!" Black cats cackle, "What was that? Sounded like a laughing rat!" Violet mounts her witch's broom. Makes white fur glow purple gray. "What was that?" a youngster reels. "Run! A ghost!" another squeals. "White cats can be spooky too!" 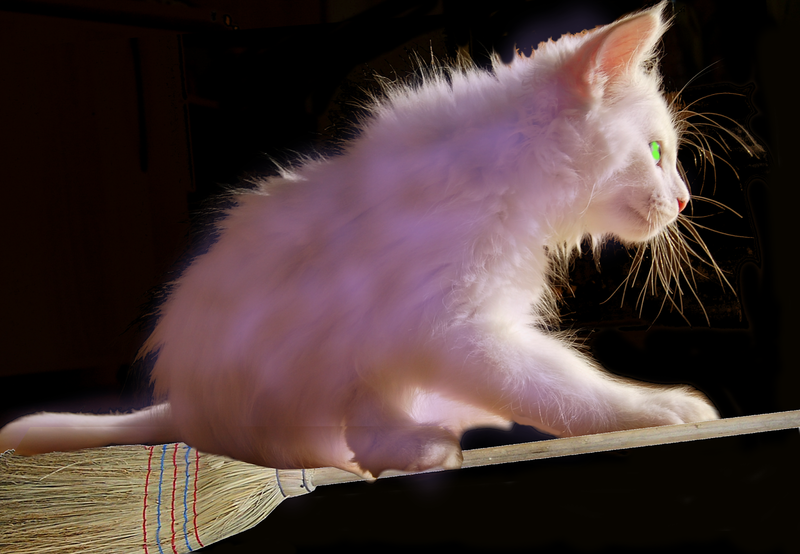 Thanks for reading and remember, don't forget white cats can be spooky too! But I would argue that a laughing rat can be a very scary thing indeed. When my rats laughed at me I knew they were up to something sinister. Yes, but you are a frail human type...not tough like a mean black cat! This is wonderful! Great job, Lauri! Thanks Cheryl! I enjoyed yours too. Very FUN! I'm glad that the white cat found her forte! I'll be looking more carefully at white cats crossing my path, for sure. Especially if one is cackling or glowing! Thanks Cathy. All cats are scary to me! Love the white cat twist! I think it's because they act like they are so smart all the time and look down their noses at you that you think maybe just maybe they now more about the universe than you. Or they are just planning to infiltrate your lap. Either way they are up to something!! Oh great gobblygook! Even I would not want to be somewhere with giant Lauri heads floating around! I hope I wasn't attacked by blog pirates. I'll have to give them the old tick-tock. Thank you so much for hosting the Halloweensie fun! Great little story and good rhyming--very hard to do! Enjoyed it, Lauri! I absolutely adore the fifth stanza. 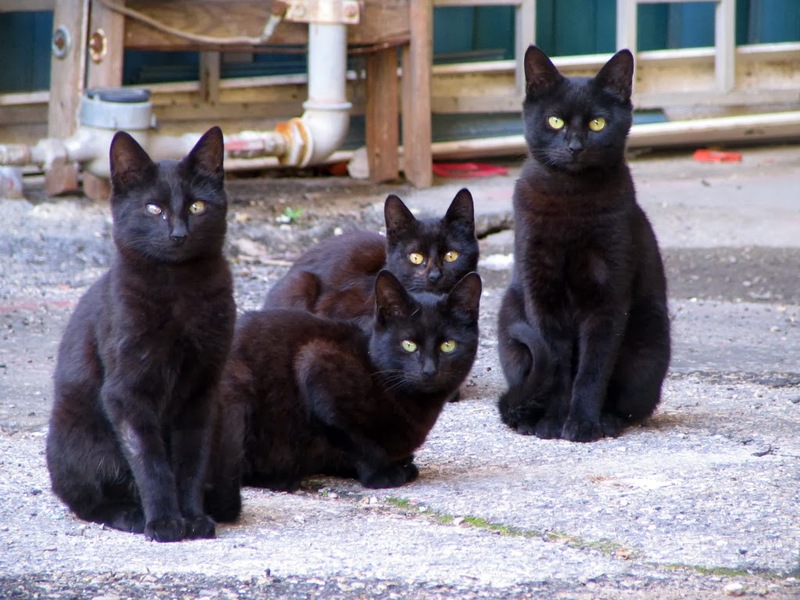 "Black cats cackle, "What was that? Sounded like a laughing rat!" It's just delightful. Thanks Heather! And you know the cats probably were creeped out by the yowl, but you know those bullies, they cover up all their fears by making fun of someone else. Big meanies!! Good for white cat who used her 'weakness' as a strength. :) Great story, Lauri...lots of fun with great images! Cute story. I'm glad Violet showed those black cats she could scare the youngsters, too! I think she could scare adults too, but it was hard to get the rhythm right for: "Was that a missile shooting through the air with a radioactive cat on it?" Ooh Janet, I hope you didn't have a yowler! Thanks, Penny! Isn't that yowling cat the best? Amazing what a great photographer can capture. I was five all over again and running for home and my mother's arms! Come to think of it, I should have had the cat scare the black cats not just some kids... but I guess that would have mean, and we wouldn't want our hero to be naughty :) The rhyme took many many tries - I hope I got it in the end! Ooh, good one! Can I go back and work that pun in now?? Let's hear it for white cats. Yeah-great choice. Thanks Joanna! Yay, white cats - even when they look like Mr. Biggelsworth. Loved this story -- and so glad that the white cat overcame the bullying black cats. 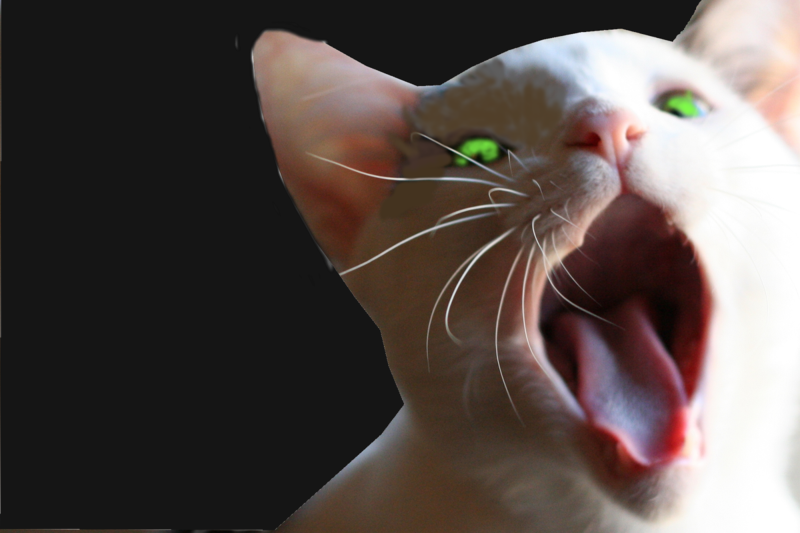 You've got to root for a little white cat who thinks he has a spooky yowl! Love the twist! Great job, Lauri! Definitely spooky! We have a neighborhood white cat that keeps trying to get in our house! Okay, well that's spooky! Are you an exotic cheese collector? Or perhaps he noticed some mice sneak into your house now that the weather is cooling! In the spot where she had been, black cats are not even seen! Yeah, you're right!! Those scaredy black cats just hide in the dark. You have to be tough to be seen and be spooky! I had two white cats growing up and I'm quite sure they would have thoroughly appreciated this story! Also, from one rhymer to another, it reads beautifully! 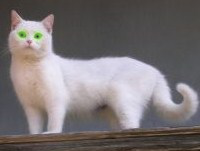 I think you're right, white cats can be scary, especially with those green eyes. As for laughing rats, almost as scary as spiders. Almost. You just gave me the most terrible thought. If you had super human hearing, would you be able to hear some sort of horrifying sound that spiders make? Ewww, I'm sure it's dreadful. Laura, great idea about the white cat on Halloween--no one ever thinks about them! I loved the line, "Sounded like a laughing rat!" Clever! Aw, that wilted tail got me. Poor wittle kitty witty with his little taily all said and wilted :( I'm so glad he got on the broomstick anyway and showed them his glow! I love everything rhyme-y. This was cute. Thanks for sharing. I like it a lot. Thanks Jackie for stopping by. I enjoyed meeting you on your blog and your piece was magnificent! I love this Lauri! Mine has a sort of similar theme. Great twist ending! Yes, Carrie - we both felt compelled to tackle cat bullying. Well, you know, October is Anti-Bullying month! Well, Robyn anyone can rhyme so bad! But rhyming well is like training to run a marathon. I must have said "that's probably good enough" 10 times before I finally fixed every line as best I could. I hope it turned out really good enough in the end. Integrating the topic of bullying into a Halloween story is difficult. Good job, Lauri! Great story in so few words AND the rhyme was wonderful! Thank you Patricia! Your blessing on my rhyme means a lot!